New ways to find TDD (total daily insulin dose), basal rates, carb/correction factors and boluses. "A comprehensive text for both novice AND seasoned pump users who want to achieve greater independence in care and management of their diabetes. What an amazing resource!!" "The newest edition of Pumping Insulin truly gives the state of the art, up-to-date, review of practical information for any person with diabetes considering pump therapy. I recommend it to current pump users who want to fine-tune their control, and professionals interested in insulin pumps. It is packed full of good information and I learned a lot. Pumping Insulin is easily the gold standard." "Diabetes is NOT for dummies... this book will measurably raise your diabetes IQ and lower your A1c. Pumping Insulin distills extensive professional knowledge and personal experience of advanced diabetes care into bite-sized wisdom available no where else. Don’t leave injections without it !" "If you use an insulin pump or are thinking about getting one, you'll want to have this book by your side to guide you every step of the way." "This new edition of Pumping Insulin is a great tool for both patient and professionals interested in pump therapy. The book is full of practical and user friendly information to help patients be successful pump users. I recommend it to my patients and use it along with them." "Reading this extremely well written book is a pleasure. Whatever you wanted to know about insulin pumps you can find here. It is impressive to “feel” the passion of the authors to help patients with diabetes use what they regard as the best way to take insulin. Reading this book takes away the fear of using an insulin pump. You have the feeling you are the master of the technique and not the other way around. 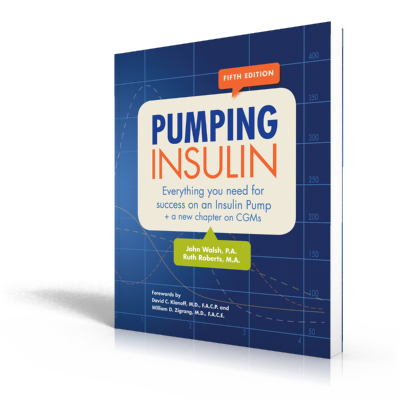 This book is very helpful for getting an excellent start, for answers when you are using your pump and for all the little tricks that you need to become an “expert” with your insulin pump. " "This edition is exceptional! All topics are included for pump therapy and CGM. This book offers the patient the ability to be in complete control of their diabetes with the appropriate knowledge." "Dr. Elliott Joslin said, “The person with diabetes who knows the most lives the longest.” For insulin pump users, the best way to know the most is through Pumping Insulin, the definitive reference by John Walsh and Ruth Roberts. Today’s pumps are so much more than just basal rates and meal boluses. Pumping Insulin helps every pump user get the most out of their insulin pump. This is one of the very few must-have books in diabetes care." Many of the challenges of managing diabetes can be overcome by the use of an insulin pump - it can be a liberating experience for someone on years of injection therapy. However, both successful diabetes management and successful insulin pump therapy require an organized, long-term commitment to learning. This book stands out as it shows us the necessary logical steps to navigate the breadth and depth of knowledge needed to succeed.